While I may travel across the globe extensively, Bangalore always has a piece of my heart. And when in town, there’s a few places I will absolutely not miss shopping at. Here’s my top favourites. This one is one of my must-visit places when I am in town. Nestled amidst the hustle and bustle of Avenue Road, Bangalore’s biggest market area, it’s a treasure trove of original South Indian and colonial antiques and collectors’ items. Quite often I lose track of time when speaking to the knowledgeable and charming owner. Bangalore has very few concept stores, so the opening of Indelust was a breath of fresh air. The store carries an eclectic mix of women and menswear. There is also decor by mostly Indian designers and artisans. The company emphasises the importance of sustainability and organic, ethically produced, handmade items, an ethos that’s very much in line with my own brand. In an unassuming part of west Bangalore, you will find Okalipuram and its fabric market, which snakes along one main road with a few offshoots. This has to be the best place for a real bargain – although there are some warehouses and actual shops, most are ‘hole in the wall’ operations. On offer is a great variety of materials from dress and suiting fabrics, bedsheets, upholstery and all the trimmings you can imagine. You need a little patience here and be prepared to trawl through a lot of stuff! Some stalls will cut by metre, others sell bundles by kilogram or ready-cut 1.2 meter lots for men’s trousers. Some of the best fabrics from production runs for European companies also end up here and you can pick up some very interesting materials at the fraction of the price you’d pay for in any store. I always stop at the Mysore Sandal Soap factory, a government-owned and managed operation, to stock up on sandalwood soaps and oil. These are the only soaps in the world made with 100 per cent sandalwood oil and come in a rather quaint, old-school packaging which I am fond of. The outlet also sells incense sticks, talcum powder and detergents. In contrast to Mumbai or Delhi, Bangalore has little heritage architecture to speak of. 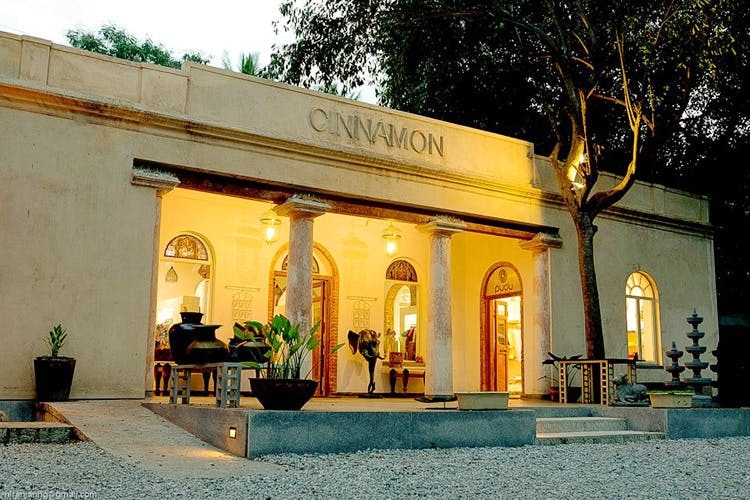 So a visit to Cinnamon is always a treat. Housed in a colonial bungalow next to Ulsoor Lake it exudes an old world charm of days gone by. A succession of rooms surrounding a picturesque courtyard accommodates a plethora of brands that offer artisanal ready-to-wear, accessories, children’s wear, gifts and homeware. And there’s a café in the courtyard for a quick refuel before indulging in yet more retail therapy.